In support of grassroots and sportsman style racing, Lubrication Specialties Inc. (LSI), manufacturer of Hot Shot’s Secret, recently announced a Support Your Local Track initiative for the 2018 season. 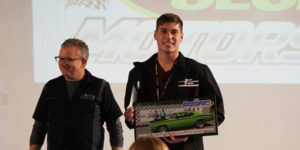 To show support for Pacemakers Dragway Park, the company’s local track, LSI recently hosted the dragway’s annual awards banquet that was co-sponsored by TrickFlow and Summit Racing Equipment at the company’s headquarters in nearby Mt. Gilead. More than 100 racers and supportive family and friends attended the banquet to give recognition to the 2017 champions. In addition, Hot Shot’s Secret is a sponsor of all six of the dragway’s Pacemakers Cash Days events. Pacemakers Cash Days is considered by some to be the epitome of grudge racing in the Midwest and has exploded in popularity recently. Pacemakers Cash Days feature automotive and motorcycle racing on an eighth mile length drag strip. Pacemakers is the second-oldest continuously running NHRA sanctioned racetrack, dating back to 1956. In addition to traditional E.T. bracket programs, the dragway also hosts test and tune Grudge Gamblers races, high school events, Junior Dragster, Q32 events, as well as its street grudge, no time type events.